Oh how long it's been! That's right! Wrestler Retrospect is back! After a year (yes, you heard that right! A year!) hiatus I'm bringing wrestling back. For those of you who are wrestling fans you know that the past couple months have been hot for the tactician know as Danial Bryan. He's been on fire! Feuding with the Shield and finally handing one of their members his first lost only a couple weeks ago. Then the following Friday handing the team itself it's first loss. He's been putting on glorious matches and even had a resurgence of his famous Yes! catchphrase. I've been a long time admirer of Bryan. I remember my first encounter with this gifted grappler in the form of a YouTube video of his time in Ring of Honor. I can't tell you who he was fighting at the time, but I remember the lights going out and Europe's Final Countdown echoing through the arena. The crowd was into it! Singing along with the lyrics, while cheering this 5'10" baby faced champion. I thought to myself "What's the big deal?" Then the match started. The man would fly around the ring one minute, then turn around and put on a devilish looking submission hold that made me, the guy watching the match, wanna scream "I QUIT!" I've always been a fan of great submissions, so for me, it was glorious to watch. A few months later, being a big fan of Samoa Joe, I purchased a Ring of Honor DVD. It of course had Joe, but it also had matches by other wrestlers. One of which turned out to be Daniel Bryan. (Known then by his real name Bryan Danielson) It was a thrill to watch. It was mainly a one-sided match. I watched Bryan ravage his opponent, a man named Spanky, with excruciating holds and hard hitting moves. This was a guy I could get behind. A short time later I learned that Bryan had been signed to WWE and I was stoked! Since his debut Bryan is someone I've enjoyed watching. He's been a whirl-wind that, even after being fired for a short time, has been unstoppable. He's held multiple titles. His biggest to date being the World Title. His character has been fun to watch. The man has made "YES!" 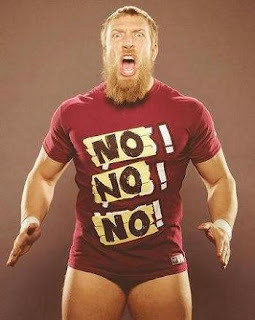 and "NO!" his catchphrases. As stupid as that sounds it's easy to get behind and chant during matches. Sam went through a phase where he'd yell one at me and I'd respond with the other. Recently Bryan has stepped things up even more and began putting on show stealing matches. I sit on the edge of my seat waiting for "Ride of the Valkyries" to hit. Yes, in the day and age where personalized music is king, Bryan has gone old school with his theme music. Using a guitar driven version of the classic song Bryan has made it cool to listen to Wagner. The last couple months of matches have been mind blowing. Watching Bryan is like watching that first match again. One minute he's putting on a painful submission. The next he's flying across the ring and landing a drop kick to some one's face in the corner. For me it's not hard to watch Bryan. He embodies everything I love about pro wrestling. An entertaining character that can really put on the holds in the ring. This current amping up of his matches has brought about rumors of a push for the big one, the WWE Title. 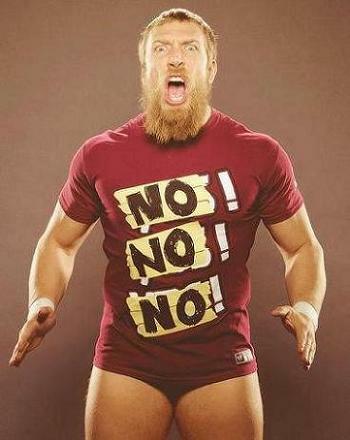 I, for one, would love to see Bryan vs. Cena. And the thought of Bryan taking the title from Cena, cause if anyone can it would be him, has me chanting: YES! YES! YES!